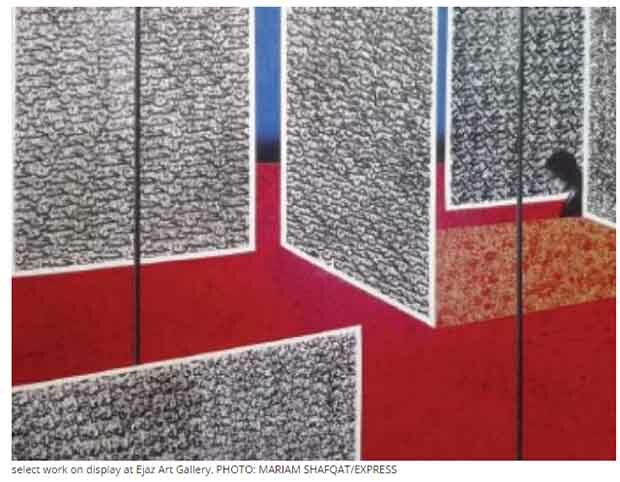 LAHORE: Quat—a calligraphy exhibition featuring the work of 11 visual artists commenced on Tuesday at Ejaz Art Gallery. Shahnawaz Zaidi, one of the featured artists, said the exhibit was unique as it featured work of artists who did not use the medium of calligraphy regularly. “Calligraphy is an inextricable part of our culture…therefore, every artist has given it a shot…but each has given it a distinct form,” Zaidi, an erstwhile Punjab University College of Art and Design (PUCAD) principal, said. He said this was extremely refreshing as the showcased work represented how the medium had been approached by different artists instead of routine calligraphic renditions. “I don’t think I have done any calligraphy in my work as the genre requires great skill,” Zaidi said. He said he had just painted some of Ghalib’s poetry the way one would casually inscribe it on paper instead of rendering it calligraphically. “The verse is there—part obscured, part exposed—to allow viewers to discover, rediscover and enjoy it,” Zaidi said. The erstwhile PUCAD principal said calligraphy had been used in a formidable array of ways. This, he said, had taken the art way beyond just pen and paper. Bashir Ahmed of the National College of Arts (NCA) said miniature was a subset of calligraphy. He said calligraphy was more dated than the former, with its roots in textbooks where it was used when words alone were not deemed sufficient to explicate what was under discussion. RM Naeem, another artist, said he had been inspired by the tragic events of Karbala. “The symbolism and language in my work represents what transpired there, how it unfolded and what were the reasons behind it,” he said. Naeem said the curatorial idea behind the exhibit was fascinating as it challenged artists to try something different in place of what they were comfortable with. The noted artist said such initiatives particularly helped stoke creativity. Published in The Express Tribune, June 23rd, 2016.